I find packing tough. I always take too much or forget something crucial, like underwear. What do you pack for a year away in eight different countries? It’s hard to know. I will probably spend the next week working it out. Two shirts are certainly coming along; they have been around for almost 4 years now, acquired during my days at Milton Academy. 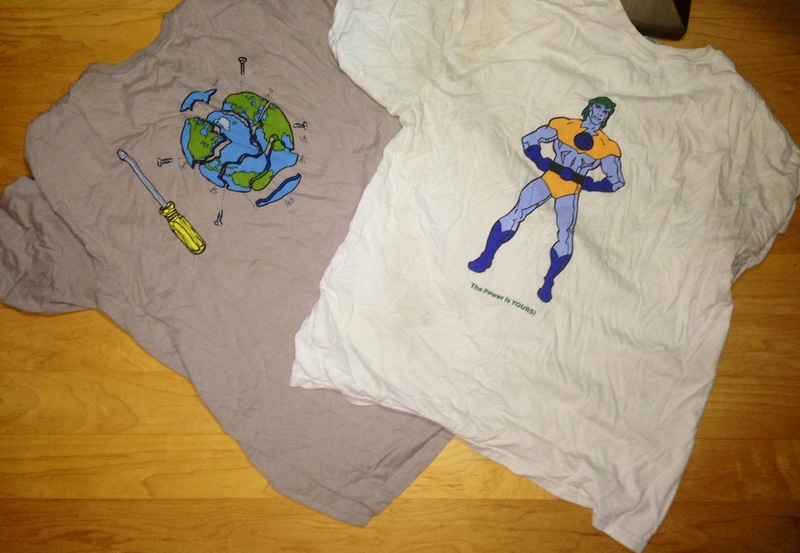 The first shirt features Captain Planet, the superhero from an early 90s TV show Captain Planet and the Planeteers. The group defends planet earth from disasters and educates humanity about these catastrophes along the way. The shirt was given to members of the Lorax Board, Milton’s student environmental group. Captain planet uses his strength, power, and dashing good looks to protect Earth. I will feel his influence when he’s on my back. Remember, the power is yours! The second shirt was given to me as a graduation gift from Mr. Bingham, my Advanced Environmental Science teacher at Milton. My best memory of that class is from senior dog day–yes, the day all the seniors bring their dogs to school. My 1 year old golden retriever, Ollie acted the opposite of the ideal canine student. While all the other dogs sat attentively and listened to Mr. Bingham discuss thermohaline circulation, Ollie decided he’d have more fun mindlessly running around the Harkness table in circles, knocking over water bottles, breaking beakers, and spilling chocolate milk on some poor girl’s white pants. He consequently lost the respect of all other dogs in the class and all members of the Milton community. To this day, my friends think he’s the worst dog ever. But I still love him, always will. Throughout the year, I worked just a little harder than Ollie did that day. The shirts Mr. Bingham gave us show the planet in pieces, it’s screws are loose. Idling next to Earth is a screwdriver. In class Mr. Bingham introduced us to the planet’s natural systems and informed us that anthropogenic forces are knocking the planet out of equilibrium. On graduation day he gave the class these shirts with the shattered planet and encouraged us to go out and fix it. Can’t wait to travel with you via this blog! And, no worries, you auntie DOES have a nice girl waiting for you back home.